Flattery will get you everywhere. Giving praise is often neglected. When was the last time you took the time to call someone to thank them about a service they performed for you? Or, in this generation, emailed a nice testimonial? It helps negotiate: Flattery is infantry on the march for negotiation. Actually it is the best, and oldest, trick in the book to bag the best deals while shopping. It breaks the ice: Sometimes, a little flattery goes a long way in getting to know new people. Surprising how much nicer people can get when their ego is pampered. It lifts spirits: When a friend has a bad hair day or is feeling down, a bit of flattery does the trick. Instantly,it makes him/her feel better. The queue moves: In a supermarket on a Friday evening, a little flattery can help you jump the queue and stave off varicose veins. Makes light of excess baggage: A minor compliment accompanied with a smile could help you save some precious dollars at the airport! Gets help when the tyre goes flat: A damsel in distress plus a little flattery. Result? A good samaritan to help and the happy prospect of keeping freshly manicured nails in tip top condition. Reduces muscle strain at the baggage claim: You can get help for lifting off your heavy suitcases with the aid of flattery, especially if you’re not travelling light. Peace and happiness with in-laws: Pay your mother-in-law that all-important compliment on her culinary skills and watch those brownie points jump right off the scale. Lunch break remains yummy: When you visit any public office for a minor task during your lunch break, a smile and some sweetness can help you get back to work on time. Spouse wows! Flattery at full throttle with your spouse is pure investment. Just guard from going OTT (over the top). Next story Financial Freedom to Relieve Stress. Previous story Where Will WALL STREET Wrap Up 2008? I think in general being nice is an attitude that gets you everywhere. Having worked in retail in almost every form and not having to do it now, makes me appreciate my job and the service all those people provide. To me there’s nothing worse than being helped by someone who makes it painfully obvious that they don’t like their job. I was stuck with a flat one day when I was on my way to work, already late which is rare for me and due to be in a meeting, which at that job only happened once a month. Terrible time for that to happen. Two really nice guys pulled over and helped me out and I thanked them and told them I wished I could give them something as a token, but they said they wouldn’t take it anyways. It gives me hope, those kinds of things. When you meant what you praised, it makes 2 people very happy – you and the recipient. 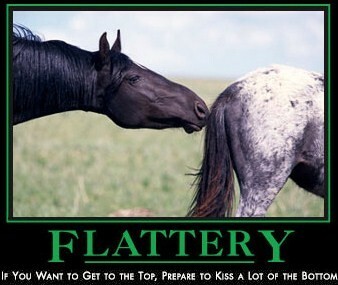 Flattety is really potent but often people are not aware of it. And those that are sometimes aware are not making use of it probably because of self ego or pride.